Last month, I posted a few of my favorite finds through Pinterest. You can read about them here. I also mentioned an activity I planned to try that was shared by Amy Abbott, who has an amazing music education blog that you must check out! 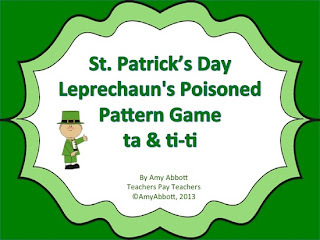 (Music a la Abbott) A few weeks ago, I introduced her St. Patty's Day Poisoned Pattern Game in my 2nd and 3rd grade classes. The basic premise is that the students read and perform rhythmic phrases, but they have to watch out for the "poisoned" rhythm. If they play that one (which is introduced prior to playing the game), then they are "out." Students began the game by playing barred instruments in a pentaton. After the poison rhythm appeared, I announced "Fruit Basket Turnover." All students who accidentally played the poisoned rhythm moved to the next level of instruments. Level 2 was large drums and temple blocks. For level 3, I used several bins of unpitched percussion instruments such as triangles, wood blocks, guiros, etc. Level 4 was a bin of rhythm sticks. Students who did not play the poisoned rhythm were allowed to switch instruments within their level. I began the game by counting before each rhythm. Students spoke and played each rhythm two times in a row. I was able to increase the speed of the game in some classes by changing the slide on beat 3 during the repeat of the rhythm. I didn't need to count each time, they simply continued playing. They enjoyed the faster pace of the game. Poisoned Rhythm has become a favorite activity among my students. They ask to play it constantly. Although I can't let them play it ALL the time, it is a great activity for the end of class when there are a few extra minutes. The benefit of the game is that it can be tailored to include any rhythm you are teaching. If you want a quick and easy way to vary the game, you can purchase Amy's rhythm bundle that includes many different versions of the game. 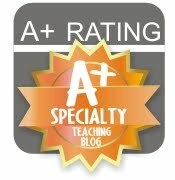 I also used the PowerPoint presentation of rhythmic slides with my first graders after they learned ta and ti-ti. Students sat in a circle, read the rhythm once, then spoke the rhythm and played auxiliary instruments twice. Between each slide, they passed their instruments to the next person. Have fun, but watch out for that poisoned rhythm!